It would be fair to say that life has got in the way of my cycling the last few years – that’s not at all a bad thing, by the way – but as the time I’ve been able to allocate to training has dropped, so has my top end and any kind of vague race fitness I might have had in the past. As a self-confessed horribly competitive person (albeit with no discernible talent to back it up) it always hurts when you don’t quite have the efforts in your legs that you thought you did. I’ve always loved pinning a number on – the hard work and reward of a gruelling training session, the nerves before a race – but with little time to dedicate to serious training I knew that heading back to road racing was always going to be a big shock. And most likely result in an unceremonious booting from the bunch before things really got going. So, this year I thought I’d try something different. Cyclocross has rapidly grown in popularity over the last few years and in the East Midlands we’re blessed with two fantastic local leagues, the well-established Notts & Derby Cyclocross League and the Leicestershire Cyclocross League which is embarking on its second season. I’d heard good things about how great ‘cross can be for your fitness and how it can improve your bike handling, and given that I wasn’t racing on the road the idea of having a laugh in the mud and smashing round a field for an hour seemed like a great idea. Most ‘cross races are less than an hour long – how hard can it be? First things first, and as a road-only kind of guy, I knew I’d need to treat myself to some new gear before embarking on this off-road adventure. You can tackle ‘cross on a mountain bike if you’ve got one in the garage, but a dedicated cyclocross bike is your best bet – on appearances, there’s not a huge visual difference from a road bike, but you’ll find bigger clearances for mud, wider, knobbly tyres for extra grip, tweaked geometry for better off-road handling, and pretty much uniformly now, disc brakes. Aside from their cyclocross abilities, many ‘cross bikes now offer a generally great option for a lot of road riding or commuting with a lot of bikes now specced with mudguard and rack mounts. Pop a pair of slick tyres on and you’ve got a great bike for winter riding or getting to and from work. I plumped for the Cannondale CAADX, a well-reviewed and hardworking bike with an aluminium frame and Shimano 105 groupset. With the geometry based around Cannondale’s out-and-out ‘cross racer, the SuperX, I knew that I had a genuinely race-ready platform at a really keen pricepoint with all the features I needed, and I couldn’t be happier – what a bike! If you’re thinking of ditching the tarmac for some mixed terrain riding I can’t recommend it enough, the handling is sharp without feeling twitchy and it feels well planted on loose surfaces. Shifting from Shimano 105 is super reliable as always and with a 46/36 chainset and 11-32 cassette you’ve got plenty of gears at your disposal. Disc brakes provide better all-round performance off-road (and are great for doing skids), although I’d maybe look to stretch my budget to hydraulic brakes in future instead of the mechanical discs that my bike has. Once the bike was sorted, I got hold of some XC style mountain bike shoes and mountain bike pedals, and I was good to go. With all the gear sorted I set out to get some idea about cyclocross with one particularly obvious starting point – I needed to ride off-road. Without a doubt, if you’ve not spent much time away from the tarmac getting more regular off-road rides in has got to be the most important thing you can do when planning to give ‘cross a go. For an uninitiated off-road rider like myself, it can take a little while to get used to how differently a bike handles, how you manage different surfaces, where the grip lies, how braking can vary in different conditions, and how to ride up steep stuff on loose ground. The more riding you can do on mixed terrain the better, and there’s the added bonus of it being really, really, really, really fun! Not only does it give your handling skills a big boost, but it also makes a really nice break from riding on the road and a well-planned route can open up so many more possibilities for your local riding. Next on the agenda was to brush up on some skills. 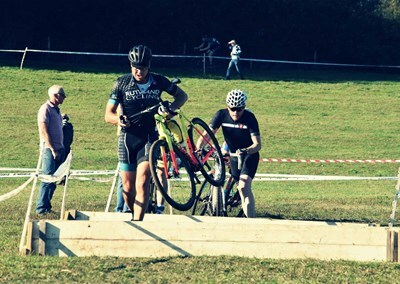 As well as being run off-road, cyclocross races can include a number of obstacles like barriers, stairs, steep banks or sandpits where you might need to get off your bike and run with it or even carry it. While in my mind I would immediately replicate Sven Nys in his prime, hopping on and off my bike in one fluid motion, things aren’t quite that straightforward in reality. Happily though, all you need is some open space, a bit of time each week, and the realisation that for those first few sessions you will likely loose any shred of dignity in front of the local dog walkers as you slowly get to grips with dismounting and remounting at increasing speed. These basics are pretty easy to pick up but definitely need regular practice, and the closer you can get to doing drills at race speed, the better. With my skills slowly developing, next up was to actually enter a race and give myself a reason to build some fitness. Full disclosure: my training did not go as planned. What started as a good first week gradually drifted to just two sessions a week, and then a bout of cold hit which wiped out another week. Yes, I am using all the excuses available. Regardless of my incompetence and complete lack of self-discipline in the weeks following my race entry, I had approximately eight weeks to train before the race I’d entered, Round 3 of the Leicestershire Cyclocross League at Prestwold Hall just outside of Loughborough. While I’ve still got decent base endurance, anything close to or above my threshold pace was pretty much non-existent so in the build up to race day I decided to focus on some tempo and strength sessions for the first couple of weeks before switching the strength sessions over to longer, threshold focused intervals. As race day got nearer, I’d planned to mix up some hard 3-5 minute intervals above threshold pace with some sprint sessions with intervals between 15 seconds and one minute to get a bit of zip back into the legs and prepare for sprinting out of the many technical corners you’ll find one a ‘cross circuit. In theory, that’s how it’d work – in practice, I stuck in whatever sessions I could and hoped for the best come race day. Race day arrived and I was a little nervous – this was something completely new and I wasn’t entirely sure what to expect. Nerves were also present for Alex & Dan, part of the team here at Rutland Cycling, who were racing CX for the first time as well, but having a few other people to share the experience with definitely made it more fun so if you’re worried about doing your first, try and drag some mates along. I was pretty overwhelmed by the sheer number of people present at the race, I’d heard about the great atmosphere you get at ‘cross races but hadn’t experienced it before. With races throughout the day from under 12’s upwards you get plenty of families turn out for the day and with multiple laps of the course there’s always action going on. Signed on, and numbers pinned on, we lined up for a practice lap before our race looking like a very niche (and very terrible) boyband in our matching Rutland Cycling kit. The course was a great option for a first race with nothing too technical but a good mix of barriers, woodland, banks and tight turns. With a sighting lap under our belt we lined up for the start of the Senior race. The pace was fast right from the off, with the regular CX racers shooting off into the first corner, and the rest of us newbies chasing to hold on. The course took us through a fast downhill grass bend, round a wide hairpin, then through a tighter turn, over some barriers and across a field before diving through some narrow woodland and a couple of muddy sections – through those first sections things bunched up as everyone tried to pile through, with heart rate shooting up and down as you’d sprint away from an obstacle only to queue up for the next narrow section. By half way through the first lap things had settled down and gaps had opened, by which point the leaders were long gone and even Alex & Dan has disappeared out of sight pretty rapidly. With 50 minutes of racing on the cards I suddenly became very aware of how little training I’d done but dug in regardless. The course took a fast sweeping downhill turn before heading through an off-camber gate and round some turns through a grassy field. We then had a steep (but ridable) bank to tackle before a few more grassy turns around some trees, with one other bank before heading through the finish. I tried to keep my pace as even as I could and as I got more familiar with the course, tried to take faster lines through the technical sections. In the end, I wasn’t last over the line and Alex and Dan didn’t lap me (they almost did), and I was pretty happy with my first competitive cyclocross outing. It’d be fair to say I completely underestimated just how hard cyclocross is. I figured it’d be a good laugh riding round a field in the mud but given I’ve been riding a long time, I’d probably be pretty good at it. I was definitely wrong! If you want to compete, not only do you need to be super fit but you also need to have the ability to apply that fitness across all different types of terrain. While I handled most stuff fairly fine, most of my training had been on paths or bridleways and I found the longer grassy sections really draining. Without a bunch to hide away in you’re also constantly ‘on’, pushing as hard as you can to get round as quick as you can. Should you give cyclocross a go? As hard as I found the race, cyclocross is an absolutely brilliant branch of cycling to have a crack at. It’s wonderfully inclusive with all sorts of riders taking part, from seasoned racers, to guys on mountain bikes, to kids, to unfit roadies like myself. The atmosphere at races is fun and friendly and there’s always plenty of people to cheer you on while you ride round barely clinging on to your lungs and, unlike road racing, even if you slip out of contention there’s still plenty to challenge yourself and push you to get to the finish. If you’re feeling a bit jaded with road riding, or dreading the thought of a winter on the turbo you should absolutely give cyclocross a go – it provides a great bit of change, opens up new possibilities for your riding, keeps you in good shape, and will probably make you realise you’re not quite as good a bike rider as thought. So, what are my top tips for surviving your first cyclocross? Practice your skills. Nailing the basics will make all the difference on race day and give you that bit more confidence when you toe the line. Get out and ride. If you’re new to off-road riding, try and spend at least one ride a week picking from some local trails and bridleways to get a feel for the effect it has on your bike handling. Have the right gear. You don’t need endless kit to give ‘cross a go but the basics like mountain bike shoes and pedals will help, and a cyclocross bike is a worthy addition to your bike collection. Do some training. Cyclocross is so inclusive that you can just go out and give it a go but if you’re too competitive (like me) having some fitness to back up your lofty predictions of glorious success is probably a good idea. Riding off-road can also be much more demanding than riding on the road, so bear that in mind when planning your training. Have fun! Mixing up your road riding with some off-road exploring is brilliant, and race day itself is a fun experience. Don’t take things too seriously, accept that you’re probably going to fall off and get muddy, and enjoy it! Pick up everything you need to tackle 'cross in-store or online.